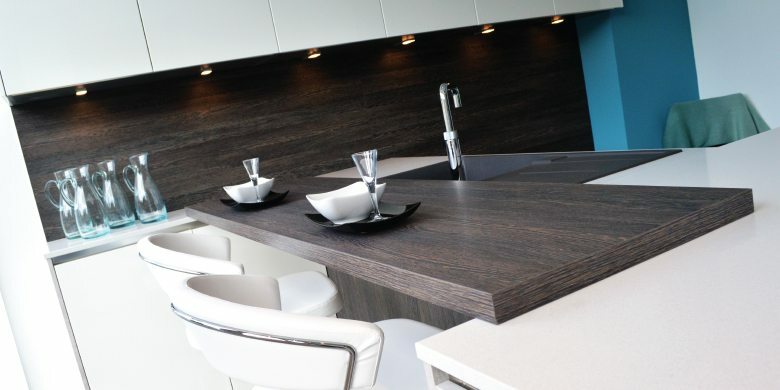 One of our renowned designers and interior experts, Roger Astin, who’s based at the Blackburn Showroom, along with Diane Smith, installed a Hacker German style kitchen with a modern, urban edge. The newest display showcase current trends in kitchen design – and the final result is sharp, edgy and cool. Concrete finish island cabinets were used to contrast against white gloss tall cabinets and dark rich Wenge wood tones were also used in the kitchen. And for that touch of class, Roger and Dianne choose near-white Quartz work surfaces, to add glamour and practicality. Of course, the display wouldn’t be complete without the best in gadgets. 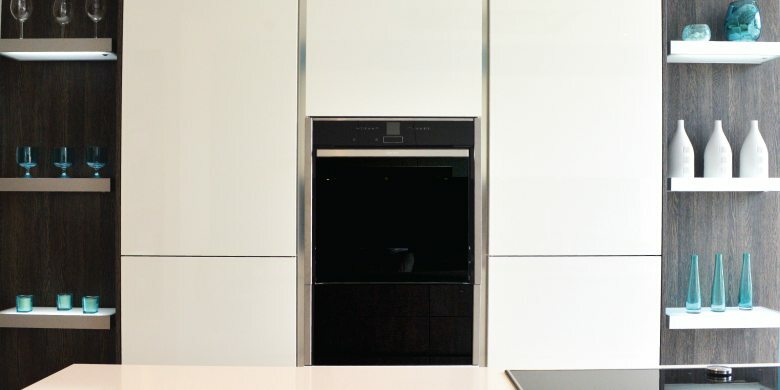 As usual, the team turned to Neff for top appliances, choosing floating tall units with ovens – that are mounted centrally, the new model Neff induction hobs and a new model flush mounted Neff extractor with LED lighting. 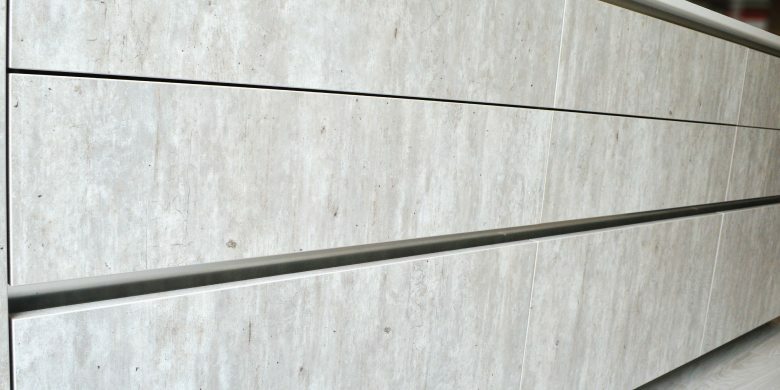 While the kitchen is full of visual interest and style, it wouldn’t be a true Kitchen Design Centre display without a stand-out feature. For this kitchen, the designers decided to make a feature of the ceiling bulkhead, which was fully designed and manufactured by the team. Knowing that lighting is key to any design, the team opted for state-of-the-art uplighting, colour matched to the fashionable teal painted walls. The finer details, such as the flooring, also received the special treatment, as pale wood Amtico flooring completed the look. This vinyl flooring is hugely popular with our clients because of its high quality effect in wood and stone – while being much simpler to maintain than the natural materials themselves. What’s more, Amtico flooring comes with a 20-year transferable guarantee against wearout! 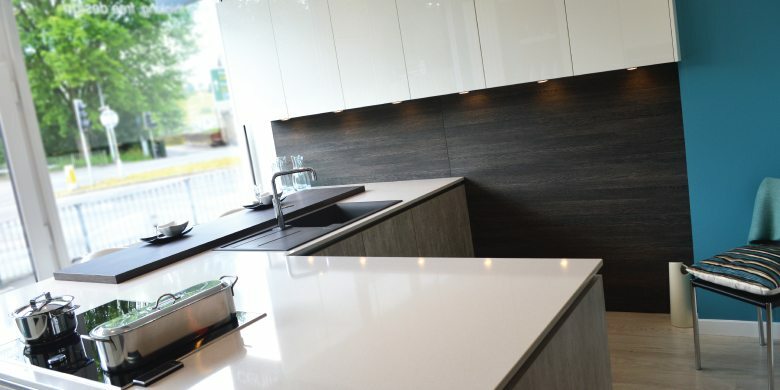 If you’d like to see this light and bright contemporary kitchen for yourself pop into our Blackburn kitchen showroom. The newest display is just one of many different displays we have available to inspire your new kitchen design. To find out where we’re based, take a look at our website.